With more universities and students joining the strike many have also chosen to participate in solidarity actions. The government is now admitting that 32 universities are 'affected by student action' although this is actually closer to the total that are blockaded, with a further 20 universities affected by some action. The national student coordination meeting had called for students to occupy train stations on the day the transport strikes were due to begin as a sign of solidarity. Occupying train stations blocking railway tracks was also a succesful tactic used during the anti-CPE movement. At Nanterre on Tuesday there was a brief occupation of the train station, during the earlier clashes with police one student reported that a policeman had pulled off his glasses and told him to leave, when he responded that the blockade had been voted for democratically the policeman crushed his glasses and struck him with a baton.. In the evening 100-200 students from Parisian universities met up at the Sorbonne after the AG and attempted to blockade the gare d'Austerlitz. 60-odd riot police were waiting for them, the police launched a few charges and the students withdrew without any major clashes. In Rouen dozens of students blocked the tracks at the train station, six were arrested by the CRS and are facing prosecution. At Rennes over 200 students tried to occupy the station and were driven back by 16 vans worth of riot police, there were at least five arrests, at least one of which was targeted. Two students at Tours were arrested leaving university buildings after an occupation of the president's office. The president had refused to allow the national coordination meeting to take place at the campus. Around 80 students attempted to protest at the local police station but CRS had blocked all of the surrounding streets. In Lyon today (Wednesday) 300 students marched through the streets, at the occupied Lyon II campus they have set up a program of film screenings and concerts open to all (program). 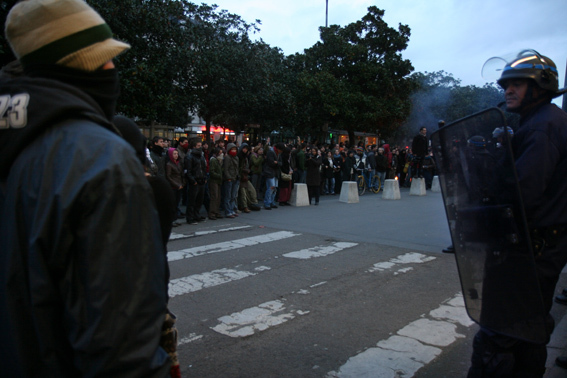 In Nantes there was a stand off outside the gare du Nord between some 300 students and riot police.